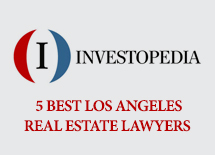 Glaser Weil is pleased to announce that David Tabibian was named as one of “The 5 Best Real Estate Lawyers in Los Angeles” in an article published in Investopedia’s Real Estate column on January 27, 2016. To read the article in its entirety, please click here. As a senior associate in Glaser Weil’s Real Estate Department, David Tabibian provides counsel and legal representation to his clients in all facets of real estate from inception to closing. He has successfully handled and closed over $3 billion dollars in real estate transactions across the country for a variety of projects, including hotels, office, retail, industrial, multi-family and mixed-use projects, among others. His success comes from his ability to aggressively pursue his client’s objectives while keeping all parties focused on closing the deal. Investopedia is the world’s leading source of financial content on the web with over 20 million unique visitors and 60 million page views each month. From early investors to financial advisors and high net worth individuals, readers depend on Investopedia as a trusted resource for accurate, timely content. Backed by a team of data scientists and financial experts, Investopedia creates the most relevant and actionable financial information for every investor. Investopedia is wholly owned by IAC. For the latest in financial news and information, visit Investopedia.com. Glaser Weil Fink Howard Avchen & Shapiro LLP is a full service law firm in Los Angeles, California. Formed in 1988, the Firm’s clientele includes a diverse mix of international, national and local corporations and private entrepreneurs.